The Computer Science Department and the College of Science at Purdue University support a unique program called Reach Out for Computer Science (ROCS). ROCS is made up of computer science students with a passion for giving back to their community, particularly when it involves teaching about technology. 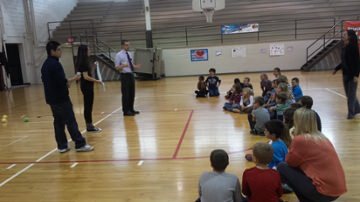 The group works with students from kindergarten to 12th grade in the state of Indiana and surrounding areas. In addition to doing information sessions, hands-on activities, and full computer science lessons, the ROCS group also is committed to helping develop new and exciting ways for students to get involved in the world of technology. In an effort to further assist teachers of computer science, ROCS students will be developing and testing curriculum for various levels and student backgrounds. The ROCS program includes students from both computer science and educational backgrounds. If you would like to have ROCS students come to your classroom, please contact Phil Sands (psands@purdue.edu). During the past five years, Purdue K-12 Outreach has engaged over 22,000 students and nearly 1,000 teachers. Much of this work is due to the dedication and sacrifice of our undergraduate students and the enthusiasm of our school partners. The ROCS program at Purdue University is widely known throughout the nation. In 2007, ROCS was featured in the Grace Hopper Celebration of Women in Computing sponsored by the Anita Borg Institute for Women and Technology in Orlando, FL.